EVENTS | CONFERENCES | MEETINGS WEBINARS FROM THE ARCHIVE Future-Proof Your Job Shop with Configurable, Cloud-Based ERP KeyedIn | gbm.media/keyedi0318 FROM THE ARCHIVE Faster Machining with Higher Surface Quality and Simpler Programming with Cimatron Software 3D Systems | gbm.media/3dsyst0418 Find current listings and archived webinars at mmsonline.com/webinars JUNE 13-14 Novi, Michigan amerimoldexpo.com The annual Amerimold trade show addresses the business develop- ments, best practices and networking interests of the plastic injection mold manufacturing industry. 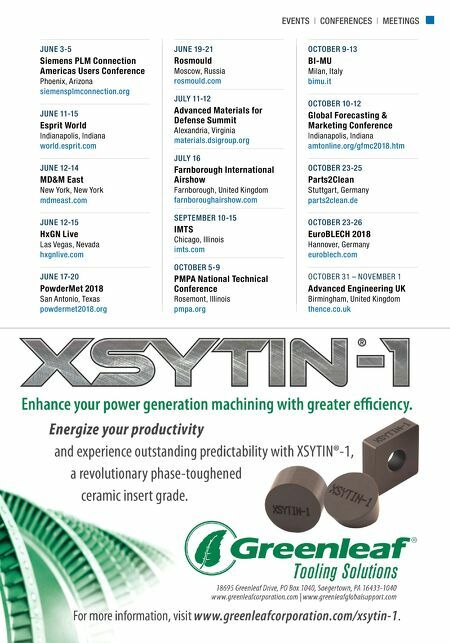 The event is presented by MoldMaking Technology, Plastics Technology and Modern Machine Shop. 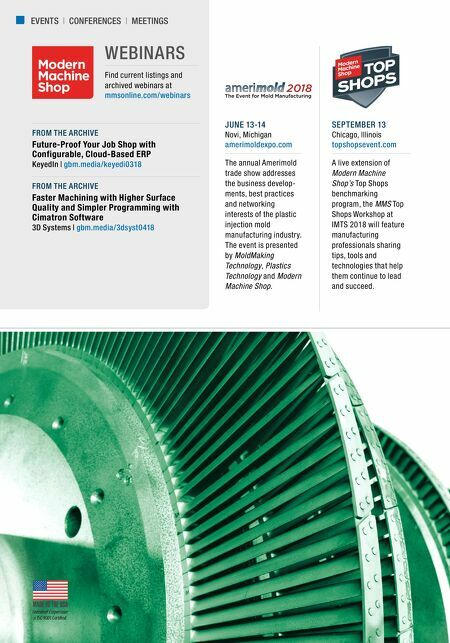 SEPTEMBER 13 Chicago, Illinois topshopsevent.com A live extension of Modern Machine Shop's Top Shops benchmarking program, the MMS Top Shops Workshop at IMTS 2018 will feature manufacturing professionals sharing tips, tools and technologies that help them continue to lead and succeed.